Chronic Dry Eye Syndrome is a condition in which a person is unable to maintain the normal, healthy tear film necessary to lubricate, protect and nourish the eye. Aging – While dry eye affects all ages, over 75% of people age 65 and older experience some degree of dry eye. Hormones – Hormonal changes in women due to pregnancy, lactation, contraceptives, and menopause can cause dry eye. Contact Lens Wear – Contact lenses can rapidly increase tear evaporation, resulting in irritation, protein deposits and discomfort. 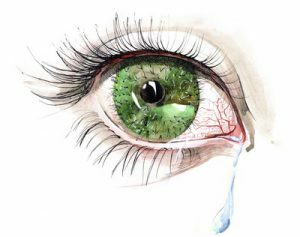 Diseases & Medications – Numerous diseases and autoimmune disorders, and medications used to treat them, can adversely affect normal tear production. Occupational Habits – Computers users or those who spend hours visually focused on their work tend to blink less frequently. Refractive Surgery – Those who have undergone laser vision correction frequently develop chronic dry eye. Chronic Dry Eye Syndrome is easily diagnosed, and it’s important to understand that it can be more than simply an annoying discomfort. If left untreated, dry eye can result in irreversible damage, potentially affecting your vision. For occasional instances of dry eye, artificial tears may provide sufficient relief. With prolonged use, however, artificial tears can actually worsen the problem. For chronic dry eye, a more effective and long-term solution such as punctal occlusion is needed. Punctal occlusion involves the non-surgical insertion of a tiny, soft silicone plug into the tear duct opening (punctum). This blocks the normal drainage path, enabling your own natural tears to remain on the surface of your eye longer. While considered permanent, punctal occlusion is readily reversible. Ask our doctor if punctal occlusion is right for you. The procedure is covered by Medicare and most third-party insurance.